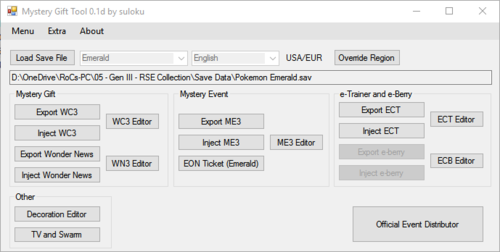 Description: Nintendo Events, Wondercards, e-Trainer cards and e-Berry editor. Updated (03-21-2019) - Proper checksum is now in place so the app works. Should not trigger antivirus. Updated (03-20-2019) to target .NET Framework v4.7.2 and compiled directly from source. Should not trigger antivirus. PC Version, GC/Wii Version and NDS Version. Next File XYORAS Friend Safari and Mirage Island Tool!